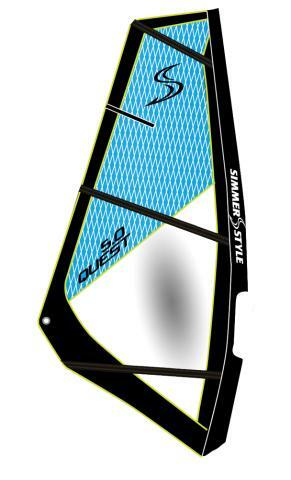 The all new Quest sail is designed to make your first windsurfing experience as fun and easy as possible. With its light weight handling and smooth power delivery it is the perfect sail for both beginners, youth sailors and / or as a sup sail. The smaller sizes feature a dacron and PVC panel layout and the larger sizes ( from 3.5 and upwards ) feature a dacron and monofilm constuction. The Quest sail is very durable for the wear n� tear seen at windsurfing schools and centers. All rig components are designed for the maximum ease of use and durability.It is sold as a package for simplicity and compatibility.QUEST BOOMThe Quest rig package includes a fixed length aluminum boom, customized for each sail size. By minimizing the design features the Quest boom offers the best possible price, durability and ease of use.QUEST MASTA fibreglass mast specifically designed for dacron sails with less mast curve.Sizes: 220 / 250 / 280 / 310 / 340 / 370 / 400 / 430FEATURES- Easy to rig.- Easy to use.- Wide power zone for beginners.- Super durable.- Color coded sail sizes.- 1.5 - 3.0 feature a PVC window.- 3.5 - 6.0 feature a monofilm window.